The best binoculars can cost thousands of dollars, and that’s not a luxury that most people can afford. On the other hand, getting a cheap model can lead to a frustrating experience, especially if it falls apart after just a few uses. It can be hard to know if you’re getting a good deal if you’re bargain shopping online, but that shouldn’t stop you from finding a model that will last a long time and be fun to use as well. We created this list of reviews of some of the best binoculars under $300 with you in mind. You can be a cost-conscious shopper and still get a good deal. We also have a buyer’s guide to binoculars, so if you’ve never owned a pair before, there’s a lot of good general information that will get up to speed on what you should be looking for. The Nikon 7576 MONARCH 5 8×42 is a masterfully-built pair of binoculars that easily rises to the top of our list. It comes with Extra-low Diffraction, or “ED” glass, which dramatically reduces the amount of chromatic aberration that you’ll experience. That means that colors will be both crisper and truer on this model than on those without ED lenses. The adjustable eyecups ensure that you can always be comfortable while you use these binoculars, even if you wear glasses. And, the very short minimum viewing distance means that you can use these binoculars for a detailed examination of close objects. While it’s not objectively lightweight, it is lightweight among binoculars. One feature that you’ll have to decide on are the eyepiece caps. They’re designed to fall on the eyepieces when you lower the model to hang from the neck strap. So, they’re not very tight-fitting when you close them manually, but they do automatically protect the lenses from falling debris when not in use. Some people will love this feature, and it will drive others nuts. Overall, you’re getting one of the best pairs of binoculars on the market with this model, and you’re getting it for a reasonable price, too. 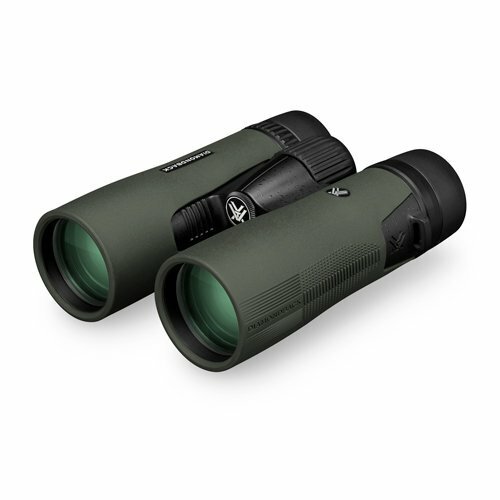 The Vortex Optics DB-205 Roof Prism is a durable, high-quality set of binoculars, that takes cues from more expensive models made by the same company but puts in them in a much less expensive package. This model has a very wide field of view, making it great for a lot of situations where you may not be able to find what you’re looking for with the naked eye. The additional field of view lets you scan more territory with each pass than competing models, while still maintaining a high level of detail. It’s also waterproof, which is expected of a model with this price tag and flushed with argon before it was sealed to prevent internal fogging due to water vapor. This model has a rugged exterior that will be hard to damage, even with frequent use. One flaw is that there’s some distortion at the edge of the view, which isn’t a huge deal and is a likely side effect of the wide field of view. Still, it would be nice if the view could be crisp throughout, and if it were, we might place it higher than second. The Nikon 8252 ACULON A211 10-22×50 was designed with the user in mind. The eyecups on this device are easy to adjust and to use and allow you always to have the perfect eye relief. If you wear glasses and a relief that’s a bit longer, no problem. Likewise, if you find yourself in need of an adjustment at the end of a long day of using binoculars, this model has you covered. And, it works well, due in large part to its 50-millimeter lens which is tied for the largest on this list and allow more light in than smaller lenses for a brighter image. It also comes with a variable zoom, not found on the other models on this list, making it arguably a more complete pair of binoculars. Resultingly, it has a long minimum focus distance that makes home use nearly impossible, but if you’re spending a lot of time in the great outdoors, you can’t go wrong with this model. The Orion 09351 UltraView 10×50 is a model that does what it must do correctly but drops the ball in the fine details. It comes with excellent eye relief, up to 22mm away from the end of the binoculars, which is the best on our list by far. It also produces excellent wide-angle, which makes this pair well-suited to astronomy applications. If you’re an aspiring astronomer, you’re going to need crystal-clear optics, and this model delivers on that promise, mostly. It does have some quality control issues. Some models ship with a “double-vision” problem, where the internal components either weren’t aligned correctly in the factory or were jarred loose during transportation. 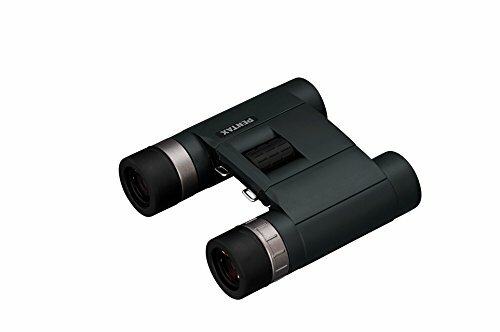 The exterior also feels cheap and not durable, which is surely part of the reason that you can get this pair at this price, despite its great optics. Overall, this model does its job well, but you can’t be sure that you will get a working model on your first try. The Pentax AD 8×25 WP doesn’t work as well as the other models on this list and earns itself the last place on our list. The one thing it does have going for it is that it has good eye relief. It’s almost as good as the previous entry and better than some others on this list, but that feature alone is not enough to save this model. First, it has small, 25-millimeter lenses. That’s not enough to consistently produce bright images, especially near dawn or dusk when you don’t have great light. 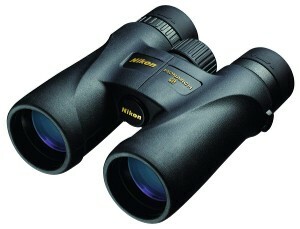 Second, it only has 8x magnification, which is not that great for a pair of binoculars at this price. While those are gripes about intentional decisions, the highest on this model, that in theory are supposed to allow it to be folded down for compact storage, are too loose for general use. You can’t hold this model up with only one hand, or else the other side will flop downwards. That’s an annoying flaw and one that you can’t ignore. While this is the cheapest model on our list, you should probably spend a bit more and get a more satisfying pair of binoculars. One of the most important features of a pair of binoculars is its optics. Binoculars are usually identified by a pair of numbers that will appear like this: 10×35. The “10” represents the magnification, sometimes called “power,” of the binoculars. In this instance, it means that the things you’re viewing appear to be 10 times closer than they are. The number after the “x” is the lens diameter in millimeters. Bigger is usually better here, as larger lenses let in more light and produce a brighter final image. Bigger lenses also tend to provide a wider field of view, though the magnification also impacts that. A binocular’s outer casing is very important. It’s the first line of defense against being dropped, so if you get a pair with a poor-quality outer shell, odds are that you’re going to knock something out of alignment at some point. Furthermore, the best companies seal the shell against outside air. If they crack, they could let in humidity, which in turn could fog up your lenses or the internal mirrors, ruining your experience. The outer material is also what you hold. Metal shells, while durable, can sometimes get slick in humid or wet conditions. The same goes for some kinds of plastic, though rubberized plastic does arguably the best job of remaining easy to hold even in wet conditions. Textured metal is easier to hold than regular metal surfaces but not as good as rubberized plastic. While binoculars aren’t dangerous enough to require safety equipment to protect you, it’s good to have safety equipment that protects the binoculars from your mistakes. Neck straps are a common feature that keeps you from accidentally dropping your binoculars and serve as a convenient way of keeping them handy for when you need them. Lens caps are another important safety feature. 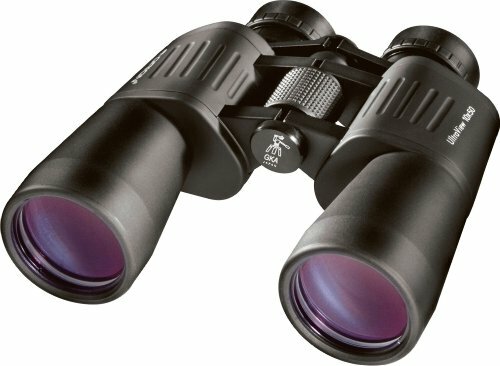 When in storage, your binoculars should have lens caps on to both protect the integrity of the lenses, but also keep them free of dust so that you always get a clear view. Some models come with caps that flip up, but don’t detach. Some people find these annoying, while others appreciate how easy it is to keep the lenses covered when they’re not in use. The Nikon 7576 MONARCH 5 8×42 is our selection for first place due to its ED glass, lightweight frame, and very close minimum viewing distance. The Vortex Optics DB-205 Roof Prism has 10x magnification, so you’ll make out more detail in its extra-wide view, but it does suffer from clarity issues around the edges. 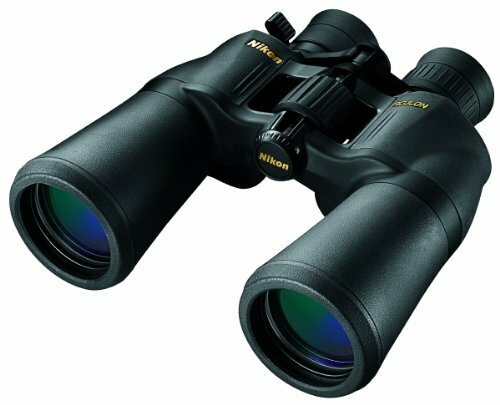 The Nikon 8252 ACULON A211 10-22×50 is user-friendly and comes with adjustable magnification, making it the best value on this list. The Orion 09351 UltraView 10×50 works well but has a cheap exterior and quality-control issues. The Pentax AD 8×25 WP has good eye relief, but otherwise poor design and construction. It’s not always easy to shop online, but we hope that our reviews and our buyer’s guide have helped you understand what kinds of deals you can get with sub-$300 binoculars. You should now be able to find the model that is just right for you.